Make a choice among our numerous recreational vehicles available in dealership. Motorcycles, ATVs, snowmobiles or side-by-side, we have what you need! Mi Locations is the renting service of Motos Illimitées. With two branches in Terrebonne and in Québec, Mi Locations offers a large choice of recreational vehicles to rent. Don't miss out on the latest news at Moto Illimitées. All powersport news to find in our Blog section. Welcome to Motos Illimitées, your motorcycle, ATV and snowmobile dealer in Terrebonne! 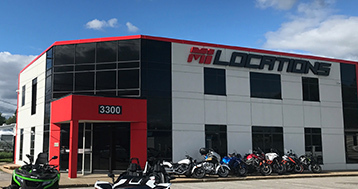 Located just minutes from Montreal and Laval, Motos Illimitées covers a total of102,000 sq ft area, with a 35,000 sq ft showroom entirely dedicated to new recreational vehicles from Suzuki, Yamaha, Kawasaki, Arctic Cat, Polaris, KTM, Triumph, MV Agusta, Slingshot, Timbersled and Indian – all you need to enjoy a purchase experience you won’t find anywhere else in Quebec! 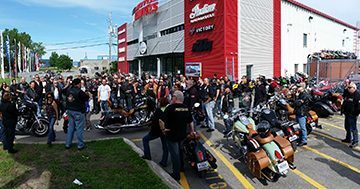 If you live outside the Montreal region, and want to benefit from unbeatable service and incredible choice on new motorcycles, motocross bikes, scooters, ATVs, snowmobiles, side-by-side utility vehicles and other motorized products, Motos Illimitées has customers all over Quebec; we also do long-distance transactions regularly and deliver anywhere in the province. Since its grand opening in 1993, our professional and dynamic team has received numerous awards from manufacturers for our sales volume and quality of service. Today, we are proud to have one of the most qualified and best-trained teams in our field to help you choose the right motorcycle, snowmobile or ATV in the greater Montreal region. 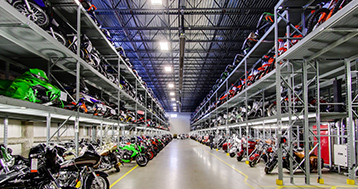 A storage and preparation service is also offered by Motos Illimitées. The objective of this comprehensive new service is to assist our clients in implementing terms of service that are carefully chosen and clearly defined by the clients themselves. This will ensure your vehicle is stored at an ideal temperature, winter as in summer, away from the elements and from prying eyes. More than just a dealer, Motos Illimitées also has a clothing boutique and a parts and accessories department offering all the biggest names, like Arai, Shoei, Kimpex, Choko, Motovan, Parts Canada etc. We also offer have a department that caters to women and children. Motos Illimitées – at your service for nearly 25 years! Come and visit us in Terrebonne, only 15 minutes from Montreal, Laval and Repentigny for the purchase of your motorcycle, snowmobile or ATV.